The Gauge Wax Jacket pairs a medium weight Sylkoil waxed cotton outer with a stitched-in quilted liner, for essential warmth and a stylish layered look. 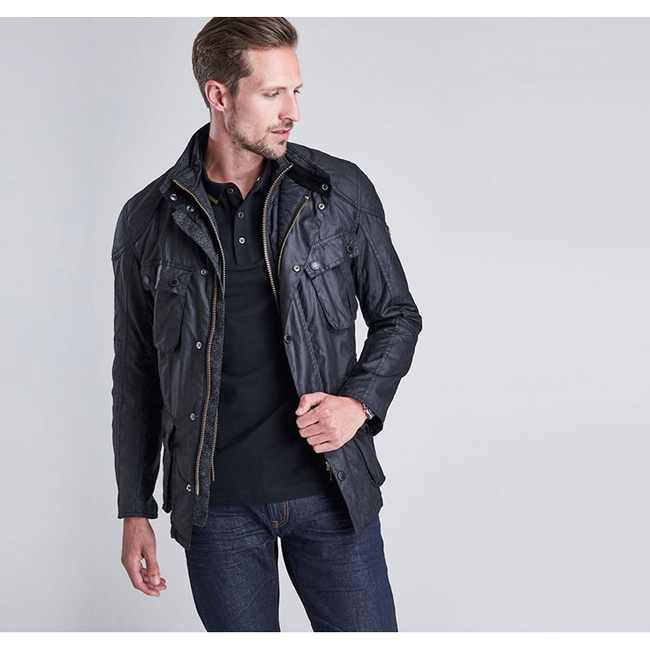 It's cut for a flattering tailored fit and features details inspired by Barbour International's motorcycle heritage, such as a funnel collar and four stud-close outer pockets, including the angled 'map pocket' to the chest. The collar stand is lined in a combination of wool and corduroy for warmth and softness, while Barbour's signature cotton tartan features on the inside of the jacket. Tonal, muted hardware and branding keep the overall look sleek and stealthy.